The Clackamas is a great option in the Portland area. Unike the Sandy, the "Clack” is not a glacial river and doesn’t experience the mid summer blow outs. More so, it’s a much larger watershed. Consequently, while many other rivers, including the Sandy, blow out during large winter rain events, the Clack can stay fishable. What seperates the Clack from all other winter rivers is the vast amount of incredible fly water. Endless miles of beautiful riffles, deep pools, greasy flats, and broad tail-outs. It’s a steelheader’s dream. 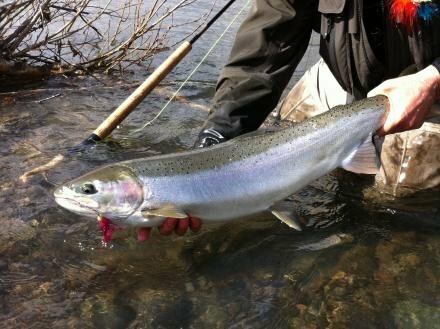 While the Clackamas has steelhead entering the river nearly year round, the best time to her incredible steelhead is from December through June.